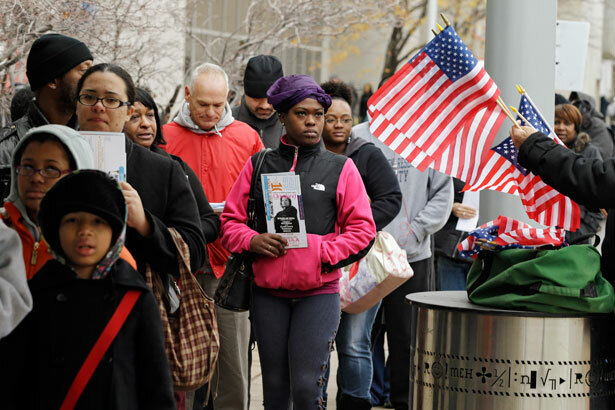 A new study highlights the vital role high African-American turnout played in 2012. Activists say voters were “outraged and energized” over threats to voting rights. Both parties should take notice. Why did so much energy go into the effort? Civil rights groups pushed back, working with the League of Women Voters, Common Cause and other organizations to mount legal and legislative challenges. But the most dramatic pushback may well have been the determined voter registration and mobilization drives organized on the ground in Florida, Ohio, Pennsylvania, Wisconsin and other battleground states. Turner’s point turns out to be highly significant. According to a new study produced by Brookings Institution demographer William Frey for the Associated Press, 2012 turnout was down overall from 2004 and 2008. But African-American turnout does not appear to have declined at the same rate as white turnout. Headlines suggested that African-American turnout levels may actually have exceeded white turnout levels, which would be a historic first. Frey tells MSNBC that he'll need to analyze more census data — some of which is not yet available — to confirm whether this was the case. But the data that is available points to the critical conclusion: While overall turnout dropped from 2008 to 2012, African-American turnout remained steady at 13 percent. That 13 percent figure is a big deal, as African Americans make up only 12 percent of eligible voters. In other words — according to numbers reviewed by Brookings, the Pew Research Center and others — the actual African-American vote in 2012 “outperformed” the group's percentage of the potential electorate. Turnout among non-Hispanic white voters has traditionally outperformed that group's percentage of eligible voters. This was still the case in 2012. But, according to AP, the margin was down, and overall the white turnout nationwide was off by millions of votes. The turnout patterns appear to have aided President Obama’s reelection run. Polling data tells us that the president always retained a good measure of popularity in the African-American community, as he did among young people. There was plenty of talk before the 2012 election, however, about an “enthusiasm gap” that would undermine turnout among voters who were most likely to be supportive of the president. But the Reverend Al Sharpton, the president of the National Action Network and the host of MSNBC’s Politics Nation, says anger over voter suppression did much to alter the dynamic. This was a big deal for Obama and the Democrats. Indeed, the emerging research on voter turnout suggests, it might well have been definitional. But that’s a prediction that does not take into account the prospect that political parties can and do change. By and large, the recent focus with regard to the future of the Republican Party has been on speculation about how the Republicans might change their fortunes by nominating a candidate with broader appeal: Florida Senator Marco Rubio or, perhaps, New Mexico Governor Susana Martinez. But the significance of rising African-American turnout—in combination with other turnout and voting patterns—suggests that the extent to which the Republican Party changes its approach on voting issues could matter as much or more than the ethnicity of candidates. The Republicans who penned that statement provided indications of their sincerity. The autopsy report was strong in its general recognition of the challenges the GOP faces in attracting African-American, Asian-American and Latino voters, as well as women and young people. But it was soft with regard to the voting-rights debate. But it is hard to imagine that Republicans can make the inroads they seek with minority voters if the party is identified with what civil rights, voting rights and good-government groups identify as voter suppression. If that identification remains, the party’s candidate recruitment and messaging strategies are unlikely to be sufficient to renew its fortunes. If the GOP becomes more clearly and seriously supportive of voting rights, on the other hand, the party’s options expand. This is something Republicans—and, frankly, Democrats who imagine a simple strategy of benefitting from Republican missteps—ought to recognize: There should not be a partisan divide when it comes to voting rights. The message for Republicans is clear enough: The backlash against what were broadly perceived as assaults on voting rights appears to have been a significant factor in the 2012 election results. If Republicans are serious about reaching out to African-American voters, and to voters in other minority groups, they have to address voting-rights concerns. Republicans have a tremendous story to tell. Theirs is not just the “Party of Lincoln,” it is the party of former Congressman William Moore McCulloch, the Ohioan who served as the ranking Republican member of the House Judiciary Committee in the critical days when the Civil Rights Act of 1964 and the Voting Rights Act of 1965 were being forged. No one who knows the history of that time doubts the vital role that McCulloch, a very conservative Republican who was a steady critic of federal spending, played in securing essential support for measures that outlawed segregation and racial discrimination. Lyndon Johnson would hail the Ohio Congressman as “the most important and powerful political force” in advancing civil rights legislation in the period. The contemporary Republican Party has lost four of the last six presidential elections. It has won a plurality of the popular vote just once since 1988. A recognition of the challenges the party faces has led to a measure of soul searching, and that in turn has inspired public and private wrangling over electoral strategies. It may be the case that some Republicans still want to play the voter-suppression card, but they do their party no favors. The smarter strategy is to recognize that voters are wary of those who seek to restrict voting. In Maine, in 2011, a referendum vote overturned an attempt by the Republican governor and legislator to eliminate election-day registration. In Minnesota, in 2012, voters rejected a Republican-backed constitutional amendment to impose a strict Voter ID law. Republicans need to engage in a rethink when it comes to voting issues. It is often said that the emerging demographics of the United States are not on the side of the GOP. However, demographics are not necessarily the stuff of electoral fate. The new studies of voter turnout offer sobering indicators for party strategists. But they also suggests a way forward. If Republicans desire to stop “writing off blocks of states or demographic votes,” the party must send affirmative signals about its commitment to voting rights. Republicans can and should do so in the spirit of William Moore McCulloch, and the many Republicans—some of them quite conservative—who recognized that his party should be in the forefront of supporting voting rights. But it’s not just Republicans who need to get more serious, and more focused, on taking practical steps to advance voting rights. Both parties need to work dramatically harder to establish a uniform commitment to defend the right to vote and to assure that every vote is counted. In short order, Congressmen Keith Ellison, D-Minnesota, and Mark Pocan, D-Wisconsin, will introduce legislation calling for a “Right-to-Vote” amendment to the US Constitution. It’s being proposed with an eye toward ending the lingering uncertainty about voting rights in the United States. Ellison and Pocan are interested in appealing to Republicans as potential co-sponsors. They should make this a high priority, not merely for the practical reason that broad support is needed for their initiative but because the American commitment to expand and sustain voting rights can and should be embraced by all parties. Immigrant rights activists, unions and others are gearing up for May Day—under the FBI’s watch. Read Allison Kilkenny’s analysis.